In early February the team of researchers boarded the RV Felipe Poey and departed the south coast of Cuba for the Gulf of Batabanó. The nine-day expedition was designed to monitor shark populations, collect baseline data on plankton and benthic communities and train scientists in data collection techniques for future monitoring. It took the entire first day to steam to the Isle of Youth. By the evening the smooth waters and night sky had blended into one endless black landscape. As a sense of isolation set-in, the boat turned towards some lights in the distance – which emanated from a lobster station floating in the middle of the Gulf. After a day crossing the ocean with no land in sight, it felt strange stepping off the boat and onto the deck at the station. The lobster fishermen, friends of the Cuban scientists, showed us around the facility which stores their daily catch in pens. This moonlight meeting was just the first of many productive interactions with fishermen throughout the journey. On one occasion we tied our boats to together, which allowed Dr. Jorge Angulo, the lead Cuban scientist and CIM director, to catch up with the Bonito’s captain. The old friends were happy to see each other again, and discussed where sharks are congregating in the Gulf. The captain suggested that we explore “Los Indios,” a region off the Isle of Youth. We ventured to Los Indios the following day to set our gear. The scientists agreed that this “edge” habitat where the reef meets the sand was more likely to have sharks, whereas much of the Gulf is shallow open water with a soft sediment bottom seafloor, not the usual preferred shark habitat. 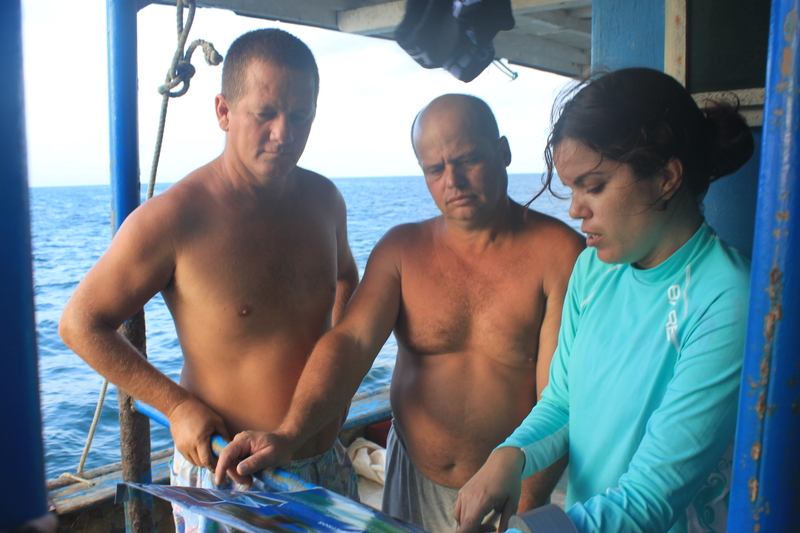 Scientist Anmari Alvarez of Cuba’s Center for Marine Research discusses manatee monitoring with two finfish fishers. Along with the tuna fishermen, we also met up with a finfish fishing boat. In the mornings, the fishermen picked up researchers to help retrieve the nets set the day before and assess the catch. We all reunited in the afternoon; the fishermen’s catch displayed on the deck—a mix of rays and fish—and the researchers had the opportunity to collect data and take genetic samples of the species of interest. Dr. Bob Hueter, head shark researcher from Mote Marine Laboratory, used a hammerhead shark caught that day to impart some shark anatomy lessons. Researchers and fishermen were quizzed on their biological knowledge and helped take genetic samples that could potentially connect Cuba’s sharks to known populations in other regions of the Gulf of Mexico. Our crew and the fishermen dispersed between the two decks of the connected boats to discuss the day’s work and shark habitat in the Gulf. While the fishermen we met do not direct their fishing towards sharks, they sometimes catch them as bycatch. One fisherman mentioned that they used to catch sharks more often in certain regions but believe that they have been overfished. The scientists agreed that the extent of overfishing is difficult to know since there is so little historical data on sharks in the Gulf. Learning from the experience of the fishermen, our group hypothesized about the shark populations — preferred habitats, seasonal migration patterns and potential locations of nursery habitats. EDF’s tri-national shark conservation program is essential to improve the monitoring of shark populations in Cuba and ensuring that species are managed sustainably. While the main objectives of the expedition focused on understanding shark populations in the Gulf, our interactions with the fishermen included discussions on a variety of marine life. Anmari Alvarez, a Cuban scientist who specializes in manatees, always takes the opportunity to talk about the marine mammal with fishermen. She reviewed a colorful flyer with the details on how fishermen can report a manatee sighting and explained that involving fishermen in monitoring is invaluable to her, as she cannot be in the Gulf every day. In one unexpected opportunity for collaboration, the finfish crew presented the Cuban researchers with a tag they removed from a sea turtle. They had been saving it for months, not knowing to whom to report the inscribed number. It just so happened that the tag was marked with the abbreviation for Quitana Roo, Mexico, and Ivan Mendez, a scientist from Mexico, was on-board to recover it. 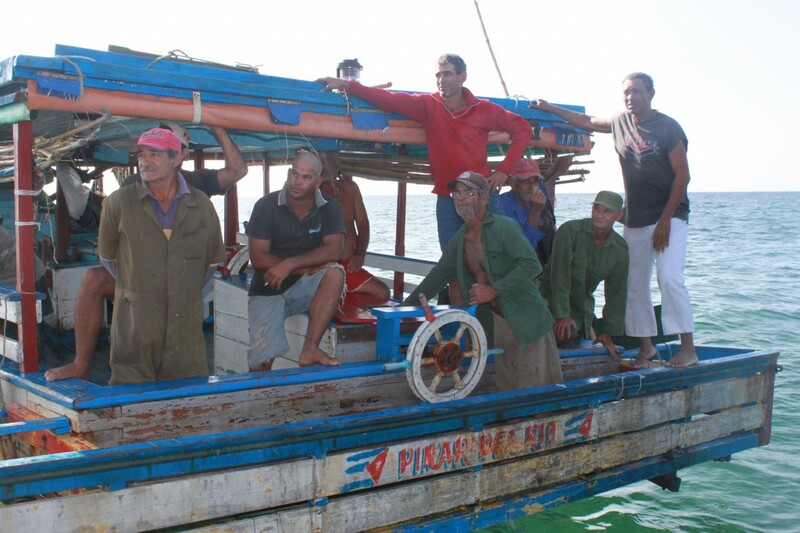 Like scientists everywhere, the Cuban researchers’ monitoring efforts rely on data from fishermen’s catch. They have recently expanded their monitoring of shark landings at several ports along the north coast but have fewer resources to collect shark data in the Gulf of Batabanó. The bonds between the fishermen and scientists proved particularly important for this exploration—from sharing knowledge of shark habitats to a bi-national turtle tag exchange. There remains much to learn about shark populations in Cuba and throughout the Gulf of Mexico. Our research team is now better prepared to collect and organize shark data and looks forward to partnering with fishermen in future expeditions.